January 19, 2017, 8:56 a.m.
A somewhat truncated set of results for this week&apos;s YouGov/Times voting intention figures as we focussed most of our questions on Theresa May&apos;s Brexit speech, which you should check out in Anthony Wells&apos;s article here. 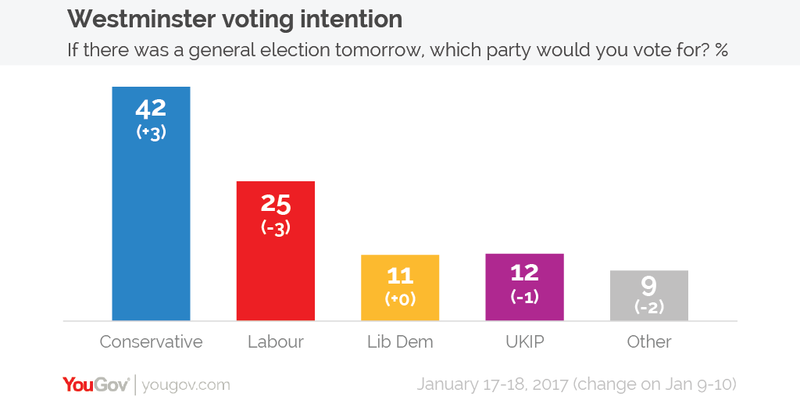 This week&apos;s YouGov/Times voting intention figures see the Conservatives on 42%, (from 39% last week), and Labour on 25% (from 28%), giving the Tories a 17 point lead. Elsewhere the Liberal Democrats are on 11% (same as last week), UKIP are on 12% (from 13%), and votes for other parties are at 9% (from 11%).